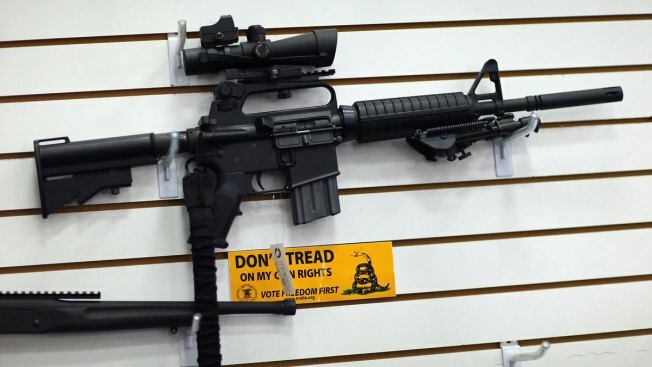 File - An AR-15 is seen for sale on the wall at the National Armory gun store on January 16, 2013 in Pompano Beach, Florida. The massacre in Orlando was the latest time an AR-15-style semi-automatic rifle was used in a mass killing. The AR-15 was used to slaughter first graders at Sandy Hook, murder Batman fans at a Colorado movie theater and kill county workers at a holiday party in San Bernardino. On Sunday, officials said a semi-automatic rifle was found amid the dozens of dead, and dozens of wounded, at the Pulse nightclub in Orlando, Florida. In the aftermath, President Obama once again railed at the ease with which domestic terrorists bent on killing as many people as possible can get their hands on high-powered guns and rifles. Update: Authorities initially identified the rifle used in the June 12 Orlando shooting as an AR-15, but multiple sources now tell NBC News the gun was a Sig Sauer MCX, a similar semi-automatic rifle. This story has been updated to clarify.